This easy homemade bread recipe produces a rustic round loaf with a delicious yeast flavor and a nice crust. 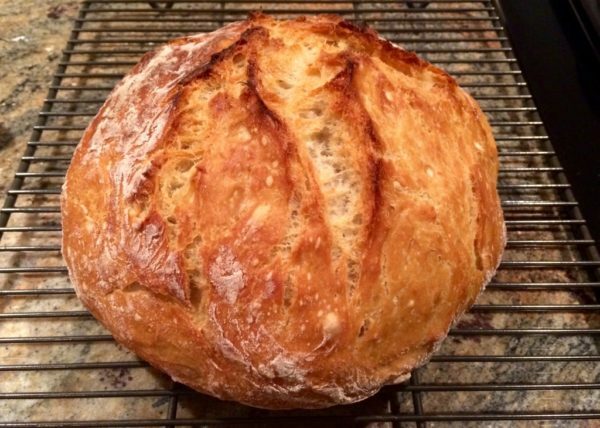 Just mix it up the night before baking and there’ll be fresh warm bread in the morning – no kneading necessary. ** UPDATE 08/26/2016 ** An updated version of this recipe with baking tips and new photos has been posted to my new recipe blog Recipe Renaissance. In a large mixing bowl, use a whisk to stir together the flour, salt and yeast. Add the water and mix with a large spoon until a shaggy mixture forms. Cover bowl with plastic wrap and let sit for 12 - 18 hours. When ready to bake, put a covered cast iron dutch oven in the oven and preheat to 450º F for 30 minutes. While the oven preheats, place the dough on a floured surface and shape it into a ball. Cover dough again with plastic wrap while the oven finishes preheating. Place the dough in the preheated dutch oven and cover. Return to oven and bake for 30 minutes. Remove the lid and bake for 15 more minutes. Remove bread from the oven and let cool on a rack for at least 10 minutes before slicing with a bread knife. Dough rises best in a 70º F or warmer room. For more recipes, visit our new site Recipe Renaissance.